The reinvention of Kratos makes for the most compelling 'God of War' game yet. By the time 2010's God of War III wrapped up, the bottomless pit of anger at the heart of protagonist / anti-hero Kratos had played itself out. The pantheon of Greek gods was destroyed, and Kratos was either dead or had disappeared -- and it almost didn't matter which. Over the course of three games, he had gone from a flawed, murderous but sympathetic character to rage personified. Without that anger, what was left to say about Kratos? A lot, it turns out. Sony wisely put Kratos' adventures on hold following a disappointing 2013 prequel before showing off a completely re-invented God of War for the PS4, lead by God of War II writer / director Cory Barlog. After spending the last week playing the game's main quest, I can definitively say that developer Santa Monica Studios has successfully brought God of War into the modern gaming era. The game's visuals are stunning, gameplay is varied and engaging, the new combat system and over-the-shoulder point of view add a fresh feel while keeping the fluid action the series is known for. But, most importantly, Kratos is more nuanced and shows more emotion in the game's opening hour than he did in the entire previous trilogy. 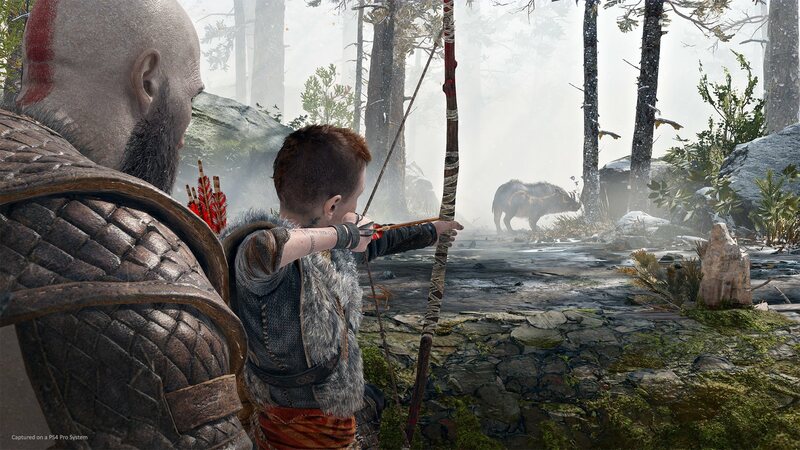 That's an exaggeration, but pairing Kratos with his mysterious son Atreus and letting them explore the Nordic landscape and its accompanying mythology together widens Kratos' emotional palette considerably. He's cold and distant and critical, but never uncaring, and watching their bond ebb and flow throughout the game infuses it with a relatable heart even as the pair battle giant ogres, witches, demons and dragons. This growth doesn't just come through cutscenes, either -- having a constant companion to chat with means the player is always learning about both characters. 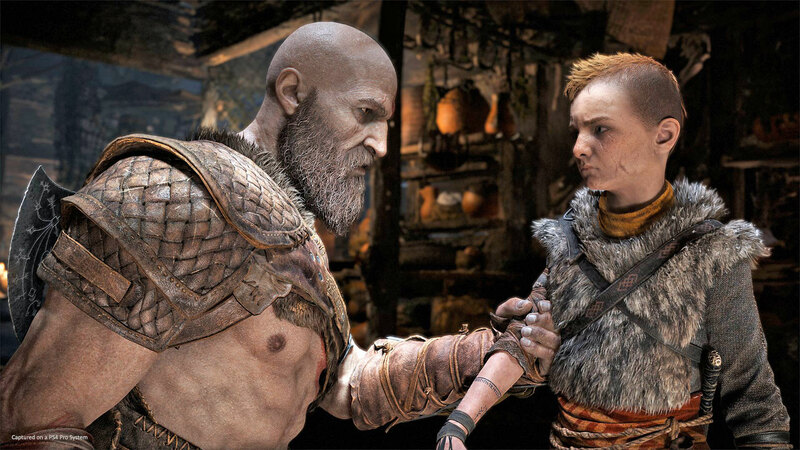 It also provides an emotional barometer that gives an insight into how both Kratos and Atreus are holding up through their mythical trials. That small, relatable father / son bond exemplifies how Santa Monica Studios made God of War work. 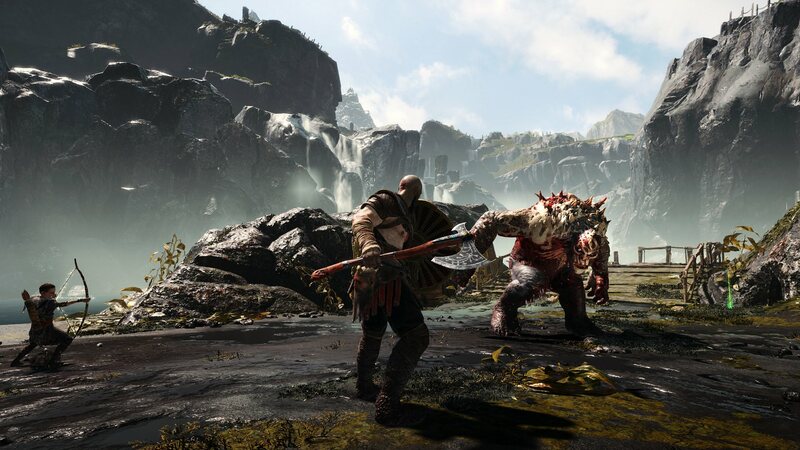 To top the extreme spectacle of the previous God of War games, the latest entry goes deliberately small to start -- the first hour or so focuses on hunting and fighting in the snowy Nordic woods with Atreus. The game lets you get your feet wet with the new battle mechanics, and there's a "boss" not too long into the game that lets Kratos flex his still-considerable might. But it's a far cry from riding on the back of Gaia as a group of Titans assails Mt. Olympus and takes down the god Poseidon. However, scaling things back means that when the game does inevitably get bigger and more epic, it has a much larger impact. The first time Kratos and Atreus paddle a small boat out into the vast Lake of Nine and come face-to-face with the shockingly huge World Serpent (which you can see at the end of this trailer) is jaw-dropping. It's also thrilling when you start exploring the vast world and come across the ruins of ancient civilizations, something that was a hallmark of previous games. God of War successfully grounds Kratos as a citizen of a small corner of the world who gets reluctantly thrust into progressively more complex and difficult circumstances. The game's increasing stakes match up well with Kratos and Atreus's growing combat skills. In yet another departure from earlier games, you're not going to be racking up 100-hit combos right off the bat, if ever (the game doesn't keep track anymore, for one thing). I'm a veteran of the series, but Kratos and his new axe felt significantly different than the Blades of Chaos from earlier games. Part of that was the control scheme -- after years of bashing the triangle and square buttons for various combos, the right shoulder buttons are used for light and heavy attacks. It took me a good several hours to get used to the change. Enemies also seem to take more punishment than in earlier games, making it a little harder to cut down large groups. But as the game's battles got more complicated, I was unlocking advanced skills, getting used to the new weapons and generally feeling much more god-like than I did at the beginning of the game. Both Kratos and I had some rust to shake off, it seems. 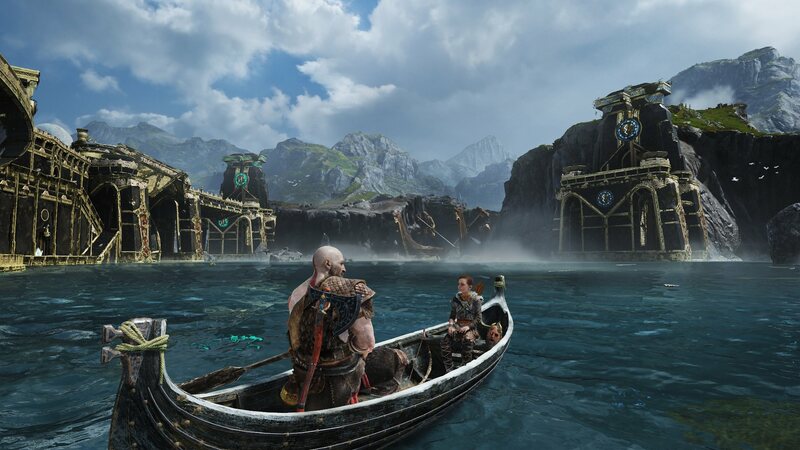 On the surface, the game's story also starts out small: Kratos leaves his home with Atreus to scatter the ashes of his wife, who had just died at the game's start. They're heading for the highest mountain in the realms, per her dying request. Naturally, there a number of hindrances along the way, and things become far more complex by the time the game hits its second half, with the pair plundering ruins, fighting mythical beasts, dealing with interpersonal drama and finding their road getting longer and longer. Ultimately, this all adds up to the rare revival of a series that exceeds its origins in many ways. Big budget, AAA gaming is so often focused purely on multiplayer, on bleeding players dry with loot boxes no one was asking for. It turns out that a combo of engaging story, wonderful visuals and fun combat still has a place in the world. God of War's developers have clearly paid attention to what Naughty Dog did with The Last of Us and Uncharted 4 as well as what Crystal Dynamics did to bring Tomb Raider into the present. Getting up-close and personal with well-written characters can bring a much-needed dose of humanity to any game -- even when you're throwing an axe through hordes of undead enemies. 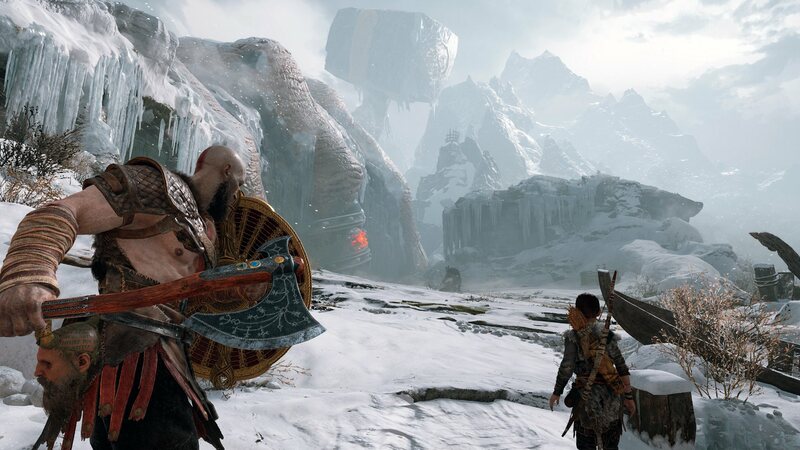 God of War is out on April 20th for the PlayStation 4.